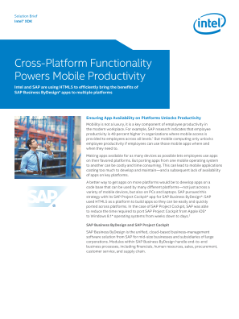 By using HTML5, SAP was able to reduce the time to port its SAP Project Cockpit* app from running on Apple iOS to Windows 8.1 from weeks to just 10 developer-days. As a result of this initial proof of concept, SAP is building all future SAP Business ByDesign apps in HTML5. Better app-development practices, like developing apps in languages that can cross platforms, holds enormous promise for helping employees be productive wherever they work and on whatever device they choose.